Before Bryan Little was making a name for himself in the NHL, he was making a name for himself in the OHL with the Barrie Colts. Little's junior career saw the 5'10 center rack up points at a torrid pace, from an almost point-per-game pace in his rookie season in 2003-04 to almost a two-points-per-game pace in his fourth and final season. His point totals increased from 58 points (34 goals, 24 assists) in 2003-04 to 68 (36 goals, 32 assists) in 2004-05 all the way to 109 points (42 goals, 67 assists) in 2005-06 and 107 points (44 goals, 66 assists) in 2006-07. His 109 point season in 2005-06 caught the eyes of NHL scouts, as his production jumped 41 points from his sophomore season. 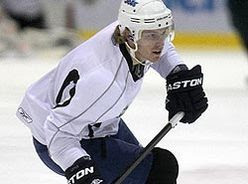 Little was then selected 12th overall in the 2006 NHL Entry Draft by the Atlanta Thrashers. Picked behind the likes of Erik Johnson (1st overall), Jordan Staal (2nd overall) Jonathan Toews (3rd overall), Nicklas Backstom (4th overall), Phil Kessel (5th overall), and Kyle Okposo (7th overall), Little falls fifth amongst the top 12th picks in career points. After 342 points in 247 career games in the OHL, Little made the jump to professional after his final season in Barrie, playing in two playoff games for the AHL Chicago Wolves in the 2007 Calder Cup Playoffs. After training camp, Little started the 2007-08 season with the big club in Atlanta. He would score 16 points (six goals, ten assists) in 48 games, with 18 penalty minutes and a minus two rating. Little was demoted to Chicago midway through the season, playing in 34 games, scoring nine goals and 16 assists for 25 points, along with ten penalty minutes and a plus one rating to end the season. He was part of the Wolves march to the 2008 Calder Cup, scoring 12 points (eight goals, four assists) in 24 playoff games. The next season, Little cemented his position in the NHL, scoring 31 goals in his sophomore season, along with 20 assists for 51 points in 79 games. However, Little's production declined the next season vastly, with the center only scoring 13 goals and 34 points in 2009-10. Despite the decline in production, Little resigned with Atlanta to a three-year, $7.15 million contract. Last season, Little's production increased somewhat, scoring 18 goals and 48 points, as he had a career high in assists with 30. With the shift to Winnipeg, Little will be looked to become the team's first line center. His speed, quick hands, and his goal scoring ability that has been seen in junior and the NHL is what the Jets are looking to Little to provide for their offense. Little may be one of the most important parts of the Jets offense for the future. Still signed for two more years with the Jets, he is in similar situations to Zach Bogosian, Blake Wheeler, and Alex Burmistrov. All are young players still looking to prove themselves and play for a new contract after the 2012-13 season. If Little can provide the offense the Jets are looking for, he may become the man down the middle for years to come in Winnipeg.